I really can’t stand people making money out of perverting ancient Chinese beliefs…first that trite “Forbidden Kingdom” rubbish just to get Jackie Chan and Jet Li in the same scene, now this. Sun Wukong would be mightily displeased. Just my opinion, mark you. Salieri are you talking about the Monkey king? Not really what you would call a belief besides the manga borrows very little from it so… WHA? First, “Journey to the West” has been ripped off a lot in Asia, so an american movie really loosely on it really won’t damage it . Second, this movie is really stupid. Of all the manga/anime to be turned into american live-action, you pick this? O_o Were they smoking pot when they came up with the idea? The only saving grace this has is that it looks like it’s gonna be loosely-based (And I mean reeeeeeeeeeeeeaaaaaaaaalllly loose) on the manga. And that just makes you wonder if this isn’t just special effects with a famous name tacked on to make it sell. Say what you want about DBZ, but having its own strong animation industry the U.S. always resisted the advance of Asian animation. Dragon Ball Z really is the one that opened up the floodgates. Is it the best? no, but if not for DBZ, you wouldn’t be watching Stand Alone Complex or Paranoia Agent on Adult Swim. But I’m not watching those either! Squidbillies and Venture Brothers, now…them’re shows. Fat Cobra would smush these clowns. There is a Chinese movie about DB is called DB: the Magic Begins , is a way better this looks. Is it the best? no, but if not for DBZ, you wouldnâ€™t be watching Stand Alone Complex or Paranoia Agent on Adult Swim. Am I the only one who read that and asked “So where’s the problem?” :) Still, just because I’m not the target audience doesn’t mean I can’t appreciate a pretty asian girl named after her underpants. And, actually, to my ear, Squidbillies is less a show than it is a collection of references and riffs that echo other Adult Swim shows… Sort of like a remix of all the stuff we’ve already seen from Williams Street as randomly chosen by dugongs. Still, it’s better Stroker and Hoop. Which is, in turn, better than Assy McGee. 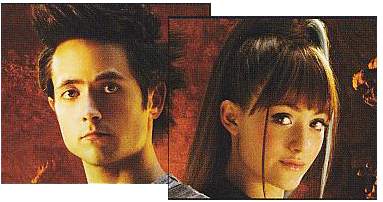 Emmy Rossum looks so hot and Justin Chatwin looks exactly like Goku! !